Rushsync lets you build your own personal internet calendar with the dates for all your favourite motorsport series. No need to download or install anything, just subscribe with your favourite calendar app. You don't need to! All Rushsync events are automatically displayed in the correct time zone, wherever you are in the world. Your calendar will automatically update with the session times as they become available so you always know exactly when the race is going to start. Which calendar apps does Rushsync support? 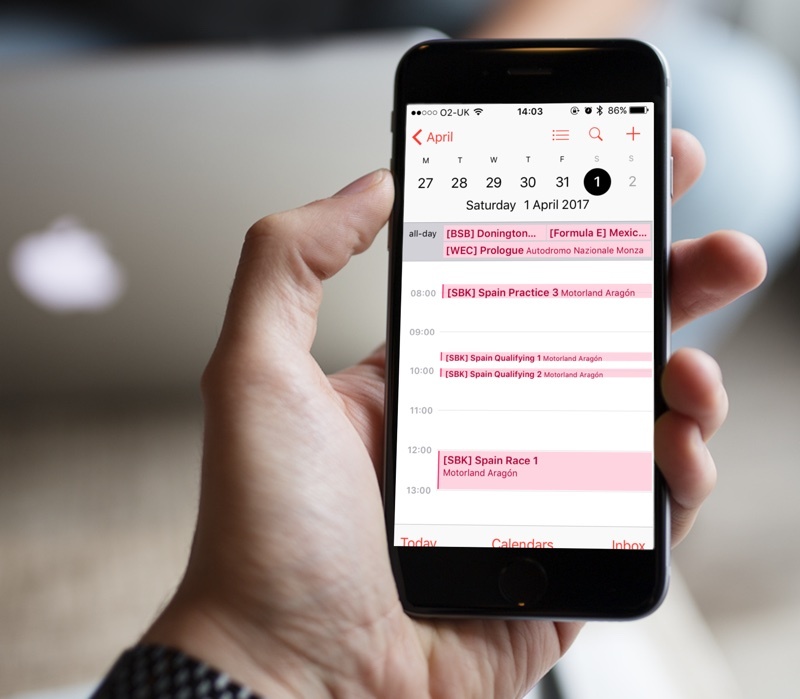 Rushsync works with all applications that support the iCalendar format including Apple Calendar, Google Calendar and Microsoft Outlook. Simply update your choices on the subscriptions page. Your calendar will pick up the changes the next time it syncs. No need to re-subscribe. This video shows you how. Which race series have full session times? Categories which have heats or stages such as Speedway or rally events are dates only. All others have full session times. Until session times are released, event dates are shown. As they become available, session times are automatically updated in your calendar. Which events are included in the Road Racing category? North West 200, Isle of Man TT, Ulster Grand Prix, Southern 100, Classic TT, Manx GP and Macau Grand Prix. Why don't I see changes to my subscription in Google Calendar? Google Calendar can take between 8 and 24 hours to sync and there is no way to force it to update. If you are using Google Calendar and have made a change to your subscription, please try waiting 24 hours for Google Calendar to next sync. Why doesn't my calendar update on iOS if it's stored in iCloud? iOS has a very old bug with subscribed calendars in iCloud. It is recommended to not store your internet calendar subscriptions in iCloud. How can I get my favourite race series added to Rushsync? Wait, didn't you used to be called MOTOCAL? Yes! We have event data for many different motorsport categories covering both cars and bikes and we felt the word 'moto' was a bit two-wheel specific.